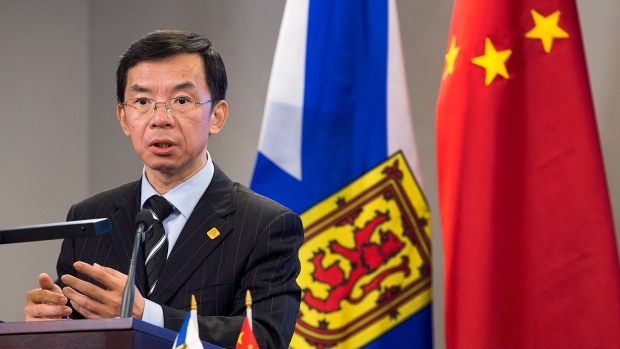 Chinese Ambassador Lu Shaye has accused Canada of applying a double standard and has decried what he sees as “Western egotism and white supremacy” in the treatment of detained Huawei executive Meng Wanzhou. China’s envoy to Canada penned an angry Jan. 9 column in The Hill Times, a twice-weekly Ottawa publication that focuses on parliamentary affairs, in which he lashes out at Canada for demanding the release of two jailed Canadians while detaining Ms. Meng. “It’s understandable that these Canadians are concerned about their own citizens. But have they shown any concern or sympathy for [Ms.] Meng after she was illegally detained and deprived of freedom?” Mr. Lu wrote. China has imprisoned former Canadian diplomat Michael Kovrig and entrepreneur Michael Spavor in what appears to be retaliation for Canada’s arrest of Ms. Meng for extradition to the United States to face allegations of bank fraud related to U.S. sanctions on Iran. Foreign Affairs Minister Chrystia Freeland has demanded the immediate release of the two Canadians and has rejected China’s demand to let Ms. Meng return home, saying Ottawa must respect the judicial process. Mr. Lu says Canada has one standard for its citizens while applying another to Ms. Meng. “It seems that, to some people, only Canadian citizens should be treated in a humanitarian manner and their freedom deemed valuable, while Chinese people do not deserve that,” he wrote. “The reason why some people are used to arrogantly adopting double standards is due to Western egotism and white supremacy." His comments represent an extraordinary statement from the envoy of a major country. He called Ms. Meng’s detention “groundless” and insisted she had not violated any laws in Canada when she was "put in handcuffs just as she was changing planes at the Vancouver International Airport” on Dec. 1. Ms. Meng was released on $10-million bail but cannot leave the Vancouver area. Mr. Kovrig and Mr. Spavor, on the other hand, are imprisoned and access to them is restricted to some extent. The two men have been accused of endangering China’s national security. “In the case of detention of Canadian citizens in China who violated China’s law, those elites completely dismissed China’s law and presumptuously urged China to immediately release their citizens. It seems that, to those people, the laws of Canada or other Western countries are laws and must be observed, while China’s laws are not and shouldn’t be respected,” Mr. Lu wrote. Asked to comment on the ambassador’s remarks, a spokesman for Ms. Freeland reiterated Canada’s concern for Mr. Kovrig and Mr. Spavor. “We are deeply concerned by the arbitrary detention by Chinese authorities of two Canadians last month and reiterate our call for their immediate release,” Alex Lawrence, director of communications for Ms. Freeland, said. Charles Burton, a former Canadian diplomat in China and an associate professor at Brock University in St. Catharines, Ont., said Mr. Lu’s comments twist the facts and further damage Canada-China relations. “Mr. Lu’s assertion that the government of Canada’s China policy is bedevilled by pervasive ‘white supremacy’ making for a ‘double standard’ demanding that ‘Canadian citizens shall be treated in a humanitarian manner and their freedom deemed valuable, while Chinese people do not deserve that’ gets it completely backward,” he said. Prof. Burton said the envoy’s statements are worrisome. The ambassador also lashed out Canada for marshalling international support to pressure Beijing to release the two Canadians. The United States, Britain, Germany, France, the European Union and Australia have all urged China to free the two men. He suggested those backing Canada represent a minority view. Mr. Lu also denounced the U.S. and Western security experts, including in Canada, for pushing Five Eyes intelligence allies to to bar Chinese telecom giant Huawei from supplying equipment for next generation 5G mobile networks on the grounds of national security. The Five Eyes alliance comprises the United State., Canada, Britain, Australia and New Zealand. So far, the United States., Australia and New Zealand have imposed bans, as have Japan and South Korea, while Ottawa and Britain are considering one. Mr. Lu said there is no evidence that Huawei has spied on behalf of Beijing. He pointed a finger at the U.S. National Security Agency, which conducts espionage and cyberattacks through its PRISM and Equation Group programs, and the Five Eyes surveillance program called Echelon.